First, is it me or is Blogger messing with cell phone pics? These pics look waaaaaaaaaaaay better on my phone... What is the point of having a mobile app if the pics look bad??? Ok, rant over. I wanted to play around with different textures. Then inspiration struck me: chrome + matte= awesome. A few months ago, The Bling Collection was genereous and offered a bottle of their SpotLight Nail Shine in Cleopatra Gold. You can check out my original review here. 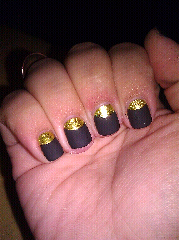 I immediately wanted to use Cleopatra Gold for this half-moon manicure. In 2 coats, I had gold chrome goodness on my nails. Then I placed reinforcement stickers, to created the half-moons. 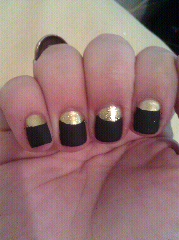 I wanted something matte to offset the bling of Cleopatra Gold. The perfect polish for this task? Orly Vinyl from the Matte Couture collections a few years back. I then used two coats of Vinyl, although if you're careful, you can get away with one. I waited for it to dry completely, peeled the stickers off and voila! A perfect manicure! I love playing around with different textures, do you? Adorable!! Lately those silly stickers have been hard for me to find. :-( I love the color combo. Thanks, I found them pretty easily at CVS in the stationary aisle. Have you tried Staples? That combo is slick! That gold looks intense! ohhh, it is definitely an intense color, not for the shy! hahaha, right? Gotta find inspiration somewhere! Love the play on textures and finishes! Thank you, I love playing around with matte polishes. oooh I love this look! you did a fantastic job. this would be great for NYE! I will keep that in mind for the holidays, great suggestion! Gorgeous- I love this combination. 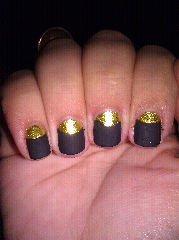 :D Shiny, sparkly gold + dark matte makes for the perfect half moon mani. Thank you, I didn't want to take it off, haha.